What is it? – Water Werks is an ingenious physics-puzzler in which you’ll need to use a garden hose to help fuzzy little monsters roll their way to the exits of a large number of craftily-designed levels. Who made it? – The game was born of the collaborative efforts of Longanimals and RobotJam. How does it play? – The game is broken up into three sets of fifteen levels each – easy, medium, and hard. The “easy” batch of levels gradually introduces how the various platforms, conveyor belts, hammers, plungers, etc. interact with your stream of water and the creatures. The stream of water for your hose can be adjusted on the fly from narrow to wide. The narrow stream is much more useful overall, but they both have their specific uses. Initially, you’ll be spraying platforms and plungers to guide the creatures towards a singular endpoint, but later you’ll be asked to get each fuzzy dude to the goal that matches him in color. The physics are great, and just spongy enough to make each attempt at a level a little unpredictable. Rescuing a certain number of the dumb little cuddlies before the time expires for each level is your goal, and you’ll use the water from your hose to operate different parts of each stage’s mechanics to hasten their squeaky escape. Presentation – The gameplay is supported by some appropriately upbeat sound effects and great music. Each critter that either escapes or plunges to a watery demise will emit a tiny cheer or yelp. The art is immediately identifiable as that of RobotJam, and the game is cheerful and visually interesting throughout. 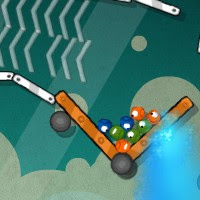 Positives – The 45 different levels are all well designed, and the physics are squishy-fun. Some of the later levels require a decent helping of skill, and the good helping of challenges will keep completionists busy for a while. It all comes together to support a very fun gameplay experience. Negatives – The music and sound, while of great variety and quality, cannot be turned off. If you’re in a sound-friendly environment, or have headphones, you won’t likely want to turn it off, but not having the option is a bit of an oversight in a game there’s little else to complain about. Why you should play it – Water Werks is terrific fun. It’s a different take on a well-loved gameplay type and incorporates some tests for the wit and reflexes. If the gameplay hooks you like it did me, you’ll be hosing down platforms and flinging critters for a while.